Following a series of successful recordings, Sarah Fox takes a lead role in Mozart's early masterpiece, released this month as part of Classical Opera's Mozart cycle on Signum Records. Leading English soprano Sarah Fox has been winning high praise for a string of recordings of late. Her last two classical CDs (a Vaughan Williams symphony CD for Sir Mark Elder and the Halle Orchestra on the Halle's own label and, more Vaughan Williams, "Dona nobis pacem" for Andrew Litton and the Colorado Symphony Orchestra on Hyperion) were, variously, Gramophone Award-nominated, and named Gramophone Editor's Choice and BBC Music Magazine Recording of the Month. And her recent Cole Porter songs CD, for Signum, was picked by David Mellor as CD of the Week in the Mail On Sunday. Still, it isn't every day that one gets to record a leading role in an underperformed Mozart opera - so she was thrilled to be asked to sing Aminta in Classical Opera's Il Re Pastore, out this month from Signum. "I was delighted to be asked to sing the role of Aminta on this recording," says Fox, "The music is stunning, with so much variety, and I get to sing one of the most beautiful arias ever written - 'L'amero, saro costante' with the wonderful obbligato violin. The whole project was a joy from start to finish, with marvellous colleagues." Hear Sarah Fox singing part of "L'amero, saro costante" from the new recording here. Fox and Classical Opera have worked together many times, often at London's Wigmore Hall. "They are simply one of the finest companies for Mozart and his contemporaries out there," says Fox, who has also sung Mozart roles at Glyndebourne and the Royal Opera House, Covent Garden, "Their artistic director and founder Ian Page is inspirational and has real vision." She stars in the new release alongside tenor John Mark Ainsley and fellow soprano Ailish Tynan. Elsewhere in this ongoing Mozart operas cycle, she also featured in Die Schuldigkeit Des Ersten Gebots. Fox has been involved in other big projects recently, not least an historic performance on the floor of the General Assembly of the United Nations last month in New York to mark the 70th anniversary of World War Two and of the founding of the UN, with the Shanghai Symphony Orchestra conducted by Long Yu. She is featured soprano in a Last Night of the Proms at Sage, Gateshead in November, and has other upcoming performances with orchestras including the Hong Kong Philharmonic, BBC Symphony, Oslo Philharmonic and Colorado Symphony. She will make her Carnegie Hall debut next season in Delius's monumental Mass Of Life. Sarah Fox is represented by Inverne Price for general management. For enquiries please contact James Inverne (james@inverneprice.com, Tel: +44 207 993 6615). 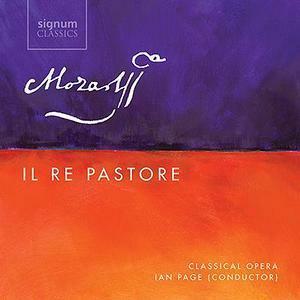 Buy the new recording of Il Re Pastore here.